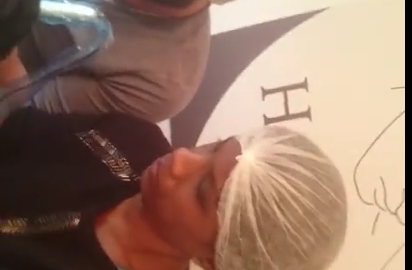 Scalp Micropigmentation (Hair Tattoo) Training. There’s Never been a better time than Now. 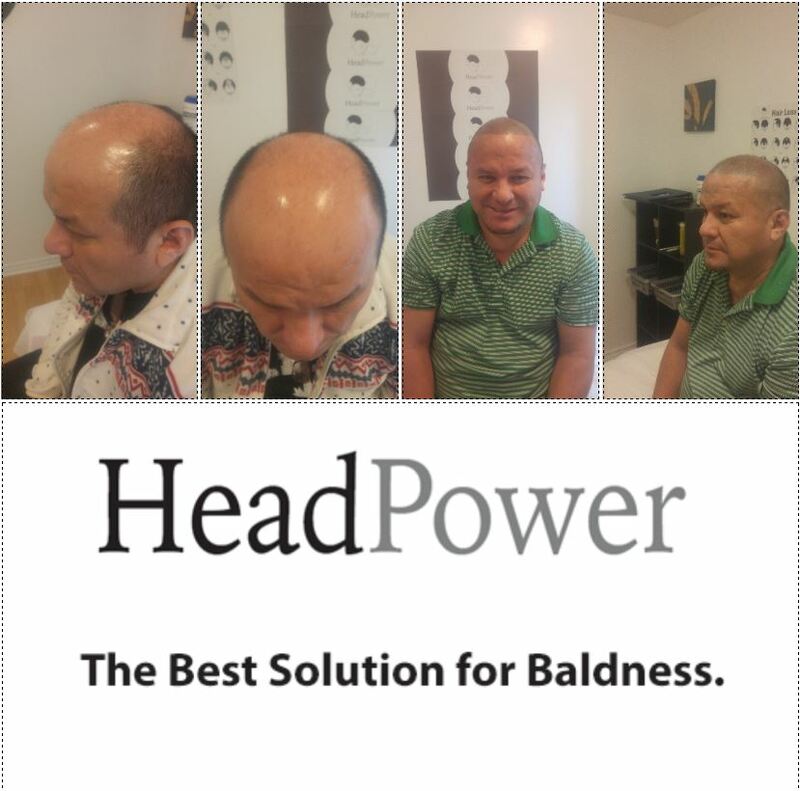 HeadPower has been in the business for years and you’ve seen incredible transformations of men in our before and after galleries and video testimonials who we cure from being bald, YES, our treatment is literally a baldness cure. reason to purchase a franchise or go in debt just to get involved in this industry. What you need is hands on training, help with marketing, templates for contracts and client forms. You need access to proper pigments, needles and a good support system, and need to know the correct application and techqniques. Look no further than HeadPower. We’re the leaders in Scalp Micropigmentation Training and will help you acheive your maximum potential in this industry. Call 1-888-977-6275 or email: info@headpower.ca for more information on how to get started. Scalp Micropigmentation Training. The Only Accredited Program Providing Certification. Certified Hair Tattoo Training. Opportunities in Hair Loss Innovation. 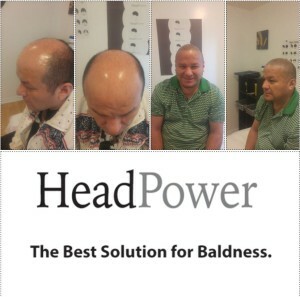 HeadPower Hair Clinic is the best scalp micropigmentation clinic for treatments and training. Patients who undergo the simple and painless procedure are instantly infused with confidence and purpose. Students who take our program feel confident and ready to work on patients with different levels of hair loss. HeadPower Hair Clinic Trainees Lisa and Deler perform a full scalp micropigmentation treatment on their third day of intensive training. Live one-on-one hands on training is the only way to confidently learn the procedure. Look how quickly these rock stars have picked up the procedure. They are almost ready to begin working on their own as Certified Scalp Micropigmentation professionals. Interested in getting trained as a Scalp Micropigmentation Artist? 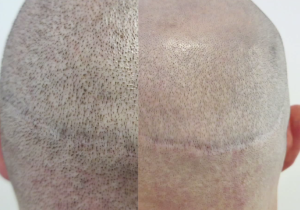 Transplant Scar Repair then Scalp Micropigmentation Treatment. First Gain the Client’s Trust. This Client first came to us with hair transplant scars on the back of his head running ear to ear. We used scalp micropigmentation to camouflage his scars a few months ago, and now he has the confidence to proceed with the scalp tattoo treatment on the entire top of his head. This client was ultra conservative at first, and was concerned about how the results were going to look, and whether we were able to get a convincing blend out for his scars that had been affecting his life. When he saw how realistic and unnoticeable his scars were, he decided to take the plunge and get his entire head treated. Patience is key. 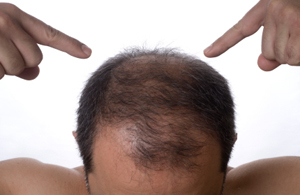 We know that SMP is the best option for anyone suffering from hair-loss, but not everyone else knows it yet. It’s the primary reason to let clients take their time to make the decision that’s right for them. Stay away from places that use pressure selling tactics. Good Scalp Micropigmentation results sell themselves, and a good Scalp Micropigmentation Provider will give you all the time you need to make the decision that’s right for you. 2 days in Toronto to get your Hair Back and your confidence. Limited availability, book your spot now. Are you Bald or Losing Hair? HeadPower has a solution to your problem. Fly into Toronto on a Friday, then fly back to your home town on Sunday. We’ll finish back-to-back Scalp Tattoo Sessions and you will go back home with new confidence and hair on your head. You’ll surprise everyone, and all of your friends and family will think you went back 15 years in a time machine because you’ll have a hairline again! Our results are guaranteed to last for 10 years or more so you’ll only have to make one trip. If you are serious about putting an end to your baldness once and for all, contact HeadPower Hair Clinic at 1-888-977-6275 or visit www.headpower.ca to learn more about the process of SMP or Scalp Micro-pigmentation. We have the cure for baldness, and there is no longer any reason to be walking around bald anymore. Book your Toronto Destination Hair Tattoo Transformation today. Are you bald or losing hair? Immediately put an end to your Baldness Now. Are you bald or losing hair? 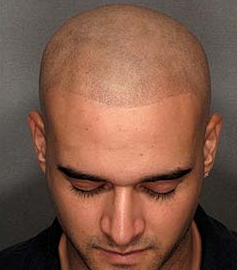 It only takes a few hours to “unbald” yourself and change your life forever. Whats the best thing you’ve ever done for yourself? Most men are putting others in front of their needs, and have been spending their lives making others feel happy. Its your responsibility to achieve greatness in life, and you owe this confidence boosting procedure to yourself. Our pain-free Scalp micro-pigmentation treatment will have you walking out of the clinic with a full head of hair the same day. There is no waiting months or years for the results. Its instantaneous and you can immediately put an end to your baldness forever. Scalp Micropigmentation Training One-on-one, or Classroom. Best Prices Best Training. 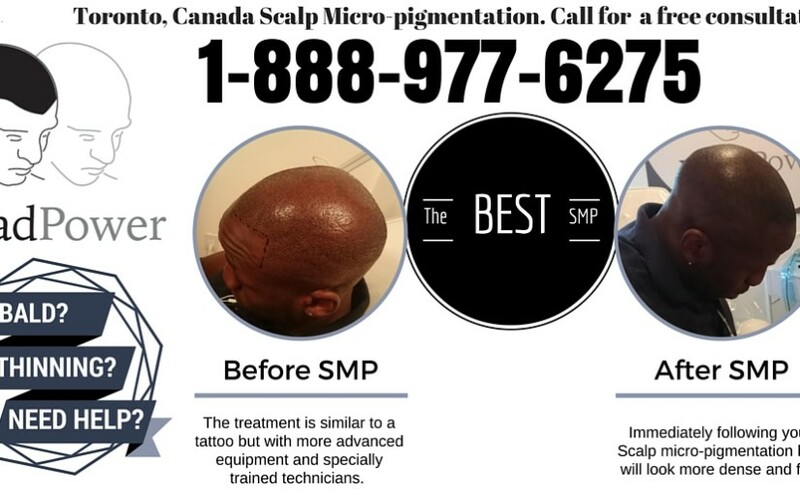 Canada has the leading scalp micropigmentation clinic. They train Doctors, Surgeons, and regular people interested in learning how to perform SMP. The facility is licensed and insured and you will be working on real people from day one. You will learn how to repair transplant scars, smp hair density, as well as hair replication techniques. The exchange rate is in your favor when you learn SMP in canada, as there are savings up to 30%. Don’t wait till everyone is doing it, get training now and become a Scalp micro-pigmentation artist. Wayne on The era of Hair Tattoos. A New Beginning for Bald Men.